Sporty, Gorgeous, Collectible, and one of the most prestigious luxury watch brands! 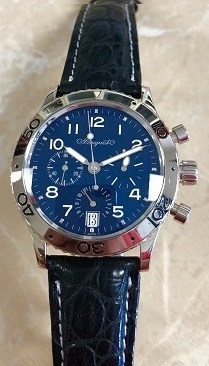 Pre-owned, in ABSOLUTE LIKE NEW CONDITION, with original Breguet Travel case. It is a beautiful, polished, white gold 40mm case, automatic movement, and date indicator, with a GORGEOUS, RARE blue color dial. It is available on a sporty new, navy blue color alligator leather strap with white stitching, and an original Breguet white gold folding buckle. Retail new $28,000.